This is the story of Baby TC who presented as a 3-month old preterm baby, born at 28 weeks gestation, with 1kg birth weight. She was born in Dhaka, Bangladesh; her parents hail from Bangalpara village in Kishorgonj district, Bangladesh. The hapless parents were shocked when they found their baby was having difficulty in her vision. She was diagnosed with ROP in both the eyes. ROP (Retinopathy of Prematurity) screening which should have been done immediately after birth was long overdue for the baby. Retinopathy of prematurity (ROP) is a disease of the eye affecting prematurely born babies. The inside of the eye (the retina) is not fully developed in a premature baby due to the early birth. Abnormal blood vessels can develop in such a retina, which can cause bleeding inside the eye and even progress to retinal detachment. After visiting various hospitals in Dhaka, the baby was finally referred to LVPEI by Dr. Muhammad Moniruzzaman, vitreo-retinal surgeon from the National Institute of Ophthalmology and Hospital, Dhaka. By the time the patient was able to procure a visa and reach Hyderabad, she was seen to have developed considerable retinal detachment: Stage 4B- right eye, Stage 4A- left eye. At LVPEI, under the leadership of Dr Subhadra Jalali, pars plana vitrectomy was successfully performed on the 2 August 2013. The difficult surgery lasted 3 hours for both the eyes. Pars plana vitrectomy is a general term for a group of operations accomplished in the deeper part of the eye, all of which involve removing some or all of the vitreous - the eye's clear internal jelly. After surgery, the child has attained reasonable good vision according to the parents. She was later following up for care with Dr. Nazmunnesa and her team from the Islamia Hospital in Dhaka who had earlier undergone ROP training at LVPEI. LVPEI has over the years been treating patients and also nurturing surgeons from various developing nations, and the happiness in the parents’ eyes is testimony to the success of this approach. 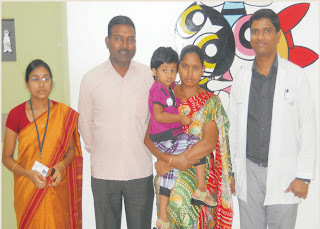 S Harshini of Machavaram town in Guntur district had strabismus (squint) right from birth. When the child was six months old, her parents took her to a doctor in their locality who recommended that they consult LVPEI but they delayed the consultation. But when the child was three years old, she developed difficulty due to the squint problem. Luckily for the parents, by that time LVPEI had opened a tertiary centre in Vijayawada. They immediately consulted the doctors at Tadigadapa. Dr Niranjan Pehere instilled courage in them and counseled them regarding the surgery. The surgery for strabismus was performed successfully. Post surgery, Mr Srinivasa Rao, Harshini's father, expressed happiness that Harshini is able to see normally having overcome the problem. 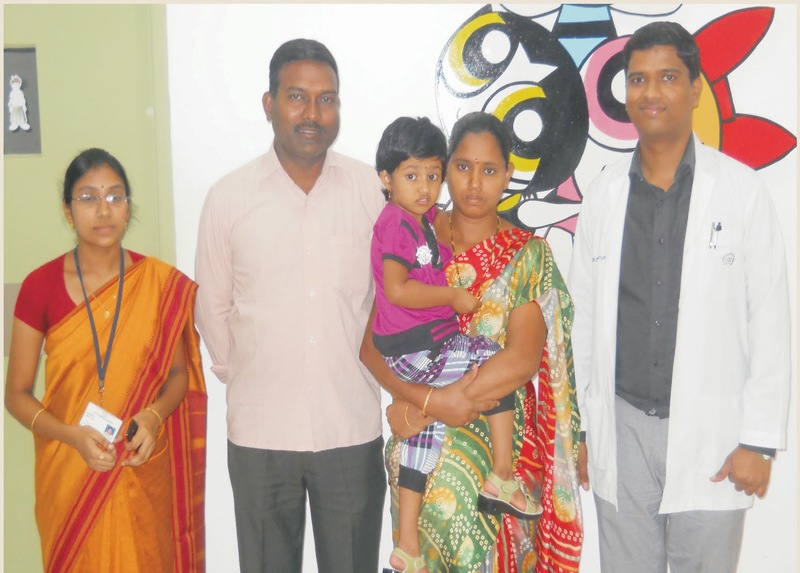 He conveyed his gratitude to Dr Niranjan, his secretary Bhavani, and the rest of his team for helping his child and felt that the people of Vijayawada were very lucky to have such a good hospital in their vicinity.